I hope everyone in the US had a great Thanksgiving. My family and I had a great time with each other and eagerly await the one month count down to Christmas. Before you know it, winter will be well set in with crunchy snow in some parts and grey skies everywhere. Once the skies lift it will be time for Adepticon! If you haven't gotten tickets yet, get 'em! Many of the 'main' events are already sold out. So don't wait any longer than you have to. My workbench has been super busy lately, adding some more commission work. Below is a piece I did quickly for a member of our DnD group for the new Dark Sun campaign setting. Finding a hairless dwarf is a rather hard thing to do. Thankfully Reaper makes model #03271 'Tamclat the Shorn"
Everyone at our last game liked the model and I think he came out ok. I tried for the first time some NMM on the hammer and other metal bits. Next time I'll have some experience under my belt and I'll try some new colors. Lol, I imagined you going around town asking if anyone had seen a hairless dwarf. 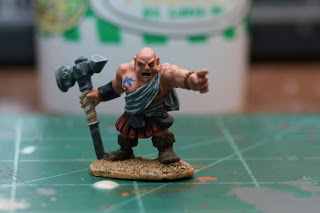 : ) You did a nice job painting Tamlac, the NMM looks good on the hammer. I think, because of the miniature itself and the fact that I knew he was for a Dark Sun setting, when I first looked at him I thought it was meant to be a stone hammer. Still really good work there, I'm always impressed with your willingness to try out new things. (Meanwhile I've barely progressed beyond my days of studio-style Goblin Green bases that I was doing twenty years ago!) Best wishes with all the projects you've got to work on!! I am also working on my ranger for the same campaign. We will see if I have learned anything.